Invoking Your Guides and Angels… Instantly! Invoking angels is quite simply calling angels into your present time and space where you can tune into the help, support and guidance. Join me in not only learning about invoking angels, but actually experience calling your angels into your present point and time right here and now. If you would prefer to read about this process… Keep scrolling down! In this article we’re not only going to talk about invoking Angels, but I’m actually going to walk you through the simple process of invoking the presence of the Angels right here and now. You see, everyone (including you) whether you realize it yet or not has Angels. We all have Guardian Angels, Archangels and so many different Angels guiding, supporting, and loving from beyond the physical. But the thing with Angels is that they honor your free will and honor your opportunity to make choices in your life and to learn lessons. And because of this, they often won’t interfere in your reality without your permission. Your angels are more than happy to connect with you, to uplift you vibrationally, and to flow their love, healing, guidance, and support into all area of your life. The process of invoking Angels is really quite simple. You might have seen people talking about lighting candles or laying crystals out or doing any other number of things to invoke angels. Really, all of this is fine, but it’s for you and not for the Angels. And like that, they’re there. But for you to really experience the presence of angels, you need to first raise your vibration. This is where things like candles, crystals, essential oils, and meditative music comes. These things can help you to shift your point of consciousness, or your point of focus, to tune into the higher vibrational realms of spirit, of Angels, of guidance, and of love. How to invoke your Angels by simply focusing inward, elevating your vibration, and tuning in. Step 1: Close your eyes and take a deep relaxing breath as you begin to imagine divine light all around you. Step 2: Imagine light above you, below you, and all around. Imagine the light is filling you and flowing all around you, raising your level of light and raising your vibration. Step 3: Focus your awareness inside. Focus on the area of your heart chakra, and imagine your heart chakra glowing with light and opening as your vibration raises. Step 4: Become aware of your direct connection with the light, with the divine, and with all that is. Step 5: Breathe, relax, and let your vibration lift. 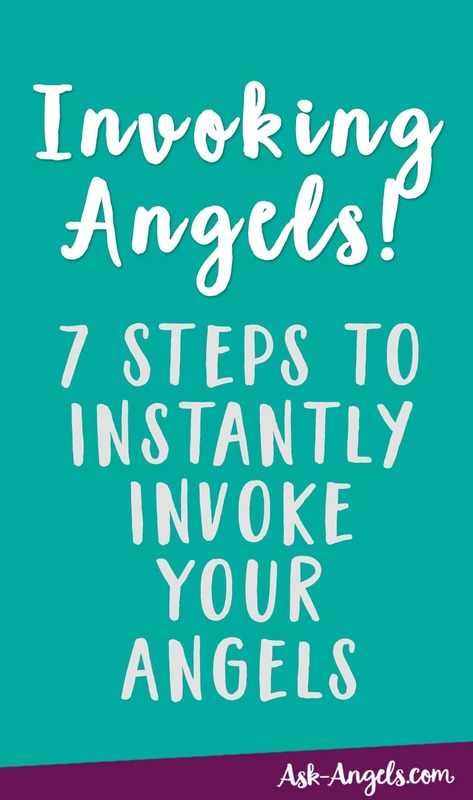 Step 7: Now, once you invoke your angels in this way, continue to focus within and just breathe and feel and become aware of your subtle psychic senses. When you ask, your Angels will connect with you, but perhaps not in the way that you think. They’ll connect through your subtle feelings, through your clairvoyance, through clairaudience, through clairsentience, through hearing, seeing, knowing on the inner planes. And so, relax, raise your vibration, open your heart, ask the Angels to be with you, and then tune in. When you invoke Angels, they always answer, so give this a try and enjoy the help, guidance, and presence of Angels in your life because they’re with you, just waiting for you to invite, invoke, and ask for their help and guidance. please educcate me how i can use my guidiance angel to inprove my situation. Thank you so much for your wonderful video on how to contact our angels. I followed your simple instructions and felt the presence of the angels immediately which gave me a great feeling of elated joy. Many blessings to you for your work and devotion. I enjoy your short angel meditations, I use them to start my day in the best way I can. Thank you!! Yay! So glad to hear… Thanks for commenting! Hi Melanie, I was on your site for a while n have quite a few meditations, but I am out of work, use them every night, they have helped me in a lot of ways, rough times, but for the first time in my life I have peace in my soul. I am n empath. So sure you can imagine life has always been rough, but I’m also a warrior soul, survival has been a way of life for me. God bless n thank you, when I can I will be back for more meditations but, have lost home, n close to care, but just had a good call about a job, so keeping the faith n yes invoking my angels, healing inner child, past n more recent traumas, n so much for. Shine on my friend… One moment at a time. So happy to hear the meditations have served you. Hi Melanie, I’ve been casually following you; receiving your emails. I have always been a believer in ‘magical thinking’ and invoking Spiritual/Angelic guidance. For some time though, I’ve kind of lost hope and direction. I’ve been in a period of some solitude, and must admit have become somewhat cynical. Today, I decided to let go of resistance and watch your 5 minute video. I held one of my quartz crystals in my receiving hand and listened to your meditation. Though, there is that part of me that longs for a quick response from my Angels, I am trusting and simply allowing whatever messages are meant to come in. Thank You! Thank you Melanie, it’s a wonderful feeling when I can connect with my Angels, and Archangels. Thank you for being here and thank you for bringing me closer to them. Thank you, thank you, thank you! I’m honored and so appreciate your kind words, in spanish and english!!!!! MY LOVELY ANGELS IN ANY ASPECT OF MY LIFE, PLEASE I REALLY NEED YOUR ASSISTANT IN EVERY AREA IN MY LIFE PLEASE AND PLEASE AND I KNOW YOU ALWAYS WITH ME AND SHOW ME SIGNS EVERY TIME AND EVERY MINUTE AM VERY GRATEFUL FOR THAT, I LOVE YOU SO MUCH MY GREAT ANGELS BIG AMEN IN JESUS NAME .